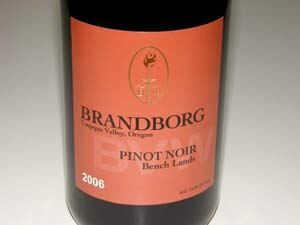 Terry Brandborg was a former longshoreman who started out his wine making career in California, crafting Pinot Noir from the Russian River Valley, Santa Maria Valley and Anderson Valley. 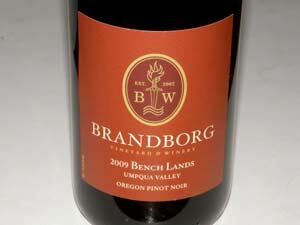 He started a small garagiste winery in San Francisco in 1986, producing 300 cases of Anderson Valley Pinot Noir. He met his wife Sue at a wine tasting event in Wyoming on Memorial Day weekend in 1998 and they immediately bonded over their love of wine. Soon thereafter they came together to search for the perfect spot to grow Pinot Noir. They fell in love with rural Elkton in the Umpqua Valley, which is located south of the better known Willamette Valley in Oregon and relocated there in 2002.. Pinot Noir had been grown there since 1972. The Brandborgs chose a site 4 miles southeast of the town of Elkton where the marine sedimentary sandstone soils are well-drained, the elevation (750-1000 ft) is above the fog line, and the southern exposures are ideal. They planted the 5-acre estate Ferris Wheel Vineyard (after the "ferris wheel ride" that led them on a search to find a perfect place to grow wine grapes) primarily to Dijon clones of Pinot Noir that came into production in 2005. Small amounts of Pinot Gris, Riesling and Syrah are also grown on the estate. A winery was built in time for the 2002 vintage and a tasting room opened. The first year production was 2,500 cases from purchased fruit in the Umpqua Valley and included several white varietals as well as Pinot Noir. 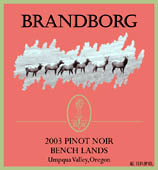 The 2005 Brandborg Ferris Wheel Vineyard Umpqua Valley Pinot Noir was chosen to be poured at the International Pinot Noir Celebration in McMinnville, Oregon. Total production has now reached 15,000 cases including custom crush fro several independent wineries. Their Pinot Gris is highly awarded. The wines are recommended and sensibly priced.